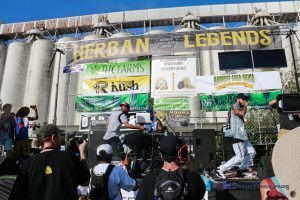 How do you get to HEMPFEST Protestival? 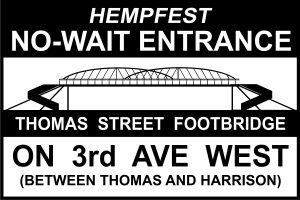 To access the North Entrance, cross the Amgen Pedestrian Bridge off of W Prospect Street & Elliott Ave W. It has an elevator and is wheelchair accessible, placing the avid attendee just north of Seattle HEMPFEST protestival north entrance. There is very little parking at W Prospect Street. So your best bet is to walk, bike, or take a metro bus to that location. For example, take metro bus 18 to north entrance, and 15 to south entrance. There are many other Metro buses routes that can drop you at either entrance too. Bicycles should enter through the North entrance to utilize the bike racks. The North entrance takes you to the Caviar Gold & Seeley Black Stages. It’s a jam packed area that not only boasts 2 stages but a wide variety of vendors including the Ganja Garden’s Food Court. This is our least crowded entrance and an excellent way to start your Seattle HEMPFEST Protestival adventure! Our new NO WAIT entrance, The West Thomas Street Pedestrian and Bicycle Overpass, is accessible at 3rd Ave W & W Harris Streets just north of Seattle Center. This new entrance has great parking potential being just 4 blocks north of Key Arena. It’ll take you across the busy Elliot & Western Avenues, and drop you right in Munchie Market! Take The West Thomas Street Pedestrian and Bicycle Overpass! To access the South Entrance, along with tens of thousands of other people, enter the Olympic Sculpture Park on Alaskan Way Downtown Seattle. This is the longest wait and walk to get into Seattle HEMPFEST Protestival. Of course if you’re a Seattle HEMPFEST Member, volunteer, speaker, or require ADA entry, you cut the line! Simply walk to the front of the Olympic Sculpture Park and look for the ADA/Member’s Entrance signs. You’ll go get to go through the express lane and get almost immediate entry into Seattle HEMPFEST Protestival. 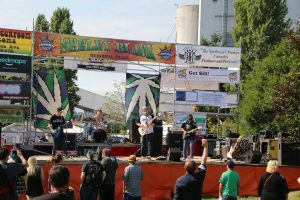 The HEMPFEST Protestival PHYSICAL address at the park is: 3130 Alaskan Way W, Seattle, WA 98121 (Don’t try to mail something there, it is a park! Also, you can NOT drive into the park from that entrance, even if you are a vendor or a delivery).